The dance known as Reog is a very spectacular dance with several dancers wearing bright colorful costumes accompanied by merry gamelan music. It is always played in the open terrain, such as in a square, street etc. This dance which always draws a lot of spectators is a traditional art dance combined with magical show or a trance dance. 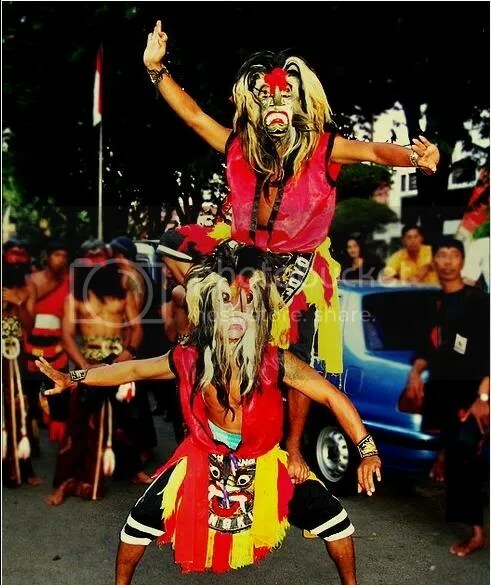 The reog dates back during the Hindu period in East Java. The story is related with the legend in Ponorogo Kingdom (+/- 70 km South East of Solo). 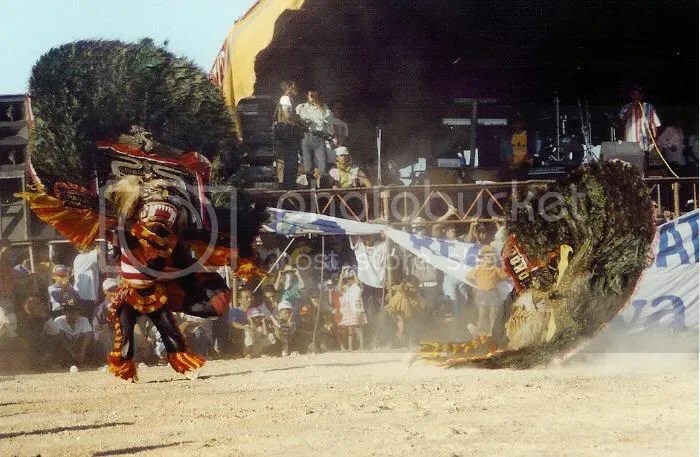 Nowadays reog dance groups can be found also in other regions of Solo, Yogya, Other Towns in East Java, Kalimantan, Jakarta, even in Suriname. One of the famous group is Reog Prambanan in the border of Yogyakarta – Solo. 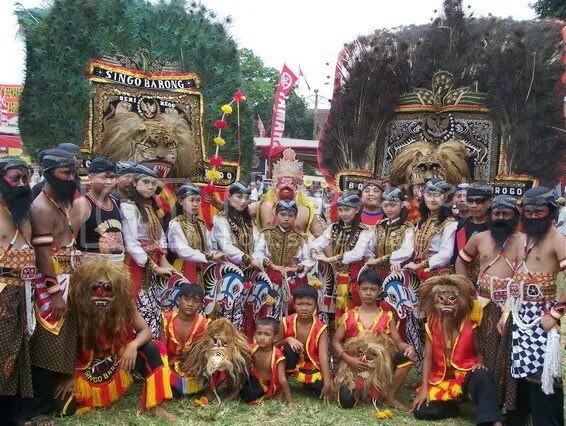 The powerful King Kelono Sewandono of Ponorogo Kingdom was famous with his fighting skills and magical power, accompanied by his Patih (Prime Minister) Bujanganom & his strong soldiers were attacked by King Singabarong, The King of Lions of Kediri Jungle, supported by his army, consisted of Lions and Peacocks. 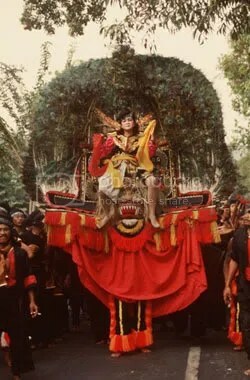 At that time the Ponorogo’s group were on the way to The Kingdom of Kediri guarding King Sewandono to marry Dewi Ragil Kuning, a princess of Kediri Kingdom. There was a big fight between mighty warriors having magical power. The peacocks flew up and down flapping their wings to support The Lions – Singa Barong. Bujanganom with his magic whip, supported by some Waroks in black traditional dress defeated The King Lion with all his followers. The King of Ponorogo and his soldiers merrily continued their way to Kediri on horse back. Singa Barong joint the procession The Peacocks kept close to Singa Barong opened their tail feathers which looked like beautiful fan. (Warok of Ponorogo is a man with strong magical power, always dresses in black costumes). 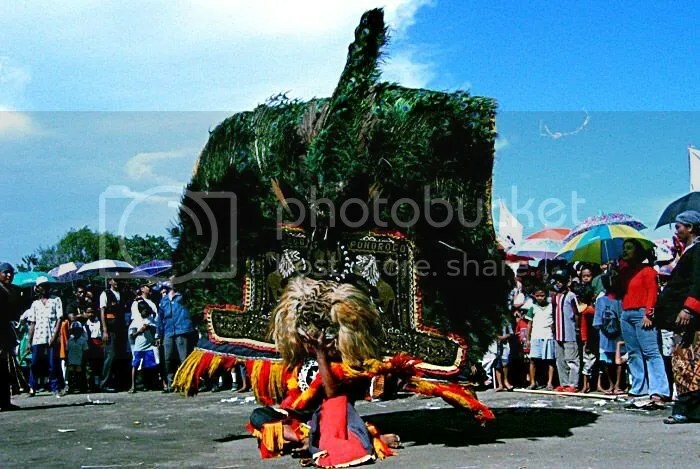 The central figure of this dance is The Lion King Singa Barong represented by a dancer wearing a mask of a Lion carrying a large peacock feather fan on top of the mask (this mask is locally called : Topeng Dadak Merak). It weight around 50 kg. The dancer has to use his teeth to hold the mask from inside. He must has a very strong set of teeth and neck to move around the mask Dadak Merak. On top of this, he has also to carry a lady representing Princess Ragil Kuning. Or sometimes, he has to demonstrate his skill and strength by carrying another mask dancer on top of him, and still he could dance with vigorous and fantastic movements. King Kelono Sewandono wearing a mask and a crown is a stylish dancer, Bujanganom also wearing a mask is an acrobatic dancer. Jatilan – good looking young soldiers riding flat bamboo horses (Kuda Kepang). 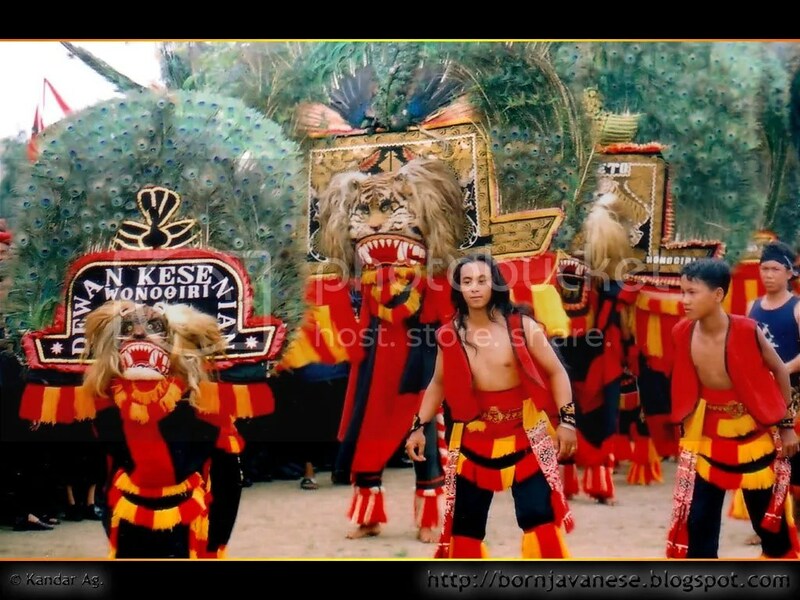 Caplokan – Wears a dragon mask to lure Singa Barong to dance more livelly.